Help us to improve your experience by filling in a simple feedback form. Has the music of The Secret Place impacted your life? 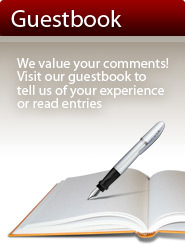 Sign the Guestbook and tell us of your experience at The Secret Place. We would love to hear from you! Click to sign guestbook. "I love the anointing on your project. You have definitely found a stream in the River. It will undoubtedly bless many people." - Judy Gossett - Grammy award winning producer who has worked with Andrae Crouch, Michael Jackson, Whitney Houston and others. "I love the anointing of God that pours forth from your heart... Your recordings are incredibly life-giving and truth imparting... There are only a few music ministers that have impacted me to the degree that you have." "I have been involved in contemporary praise and worship for the last 34 years and The Secret Place now tops my list as far as an album, 8-track, cassette or CD that is able to bring me into a place of worship. Thank you for sharing your songs." "I was spiritually dehydrated and I was serving God in my own strength. It was burning me out! ... I've gotten busy serving Him and looking for His blessings instead of just enjoying Him and sitting at the feet of Jesus... Your music has truly touched my life." "I think there is a hunger in the hearts of God's people that goes beyond what the christian music industry is offering today... There is music that impresses the soul of man, and there is a sound that comes from heaven that feeds mans spirit. Most people don't know how to listen to music, they haven't heard much of the real thing... They are, quite honestly, some of the best worship songs I've ever heard." "The Lord says you have entered into a realm now with God. There are new songs coming forth. And I see a connection between heaven and earth and some of your greatest works that you put your hand to, to deliver the song of the Lord … And I see words lined with gold .... And I see music notes lined with gold because they are of the glory realm. The Lord says as your music is being played, I see a room filled with people connecting with God in a new way. Life transforming moments, because of what you are birthing"
"Jan and I have been blessed by Ray Watson's worship music and songs for many years. I would say that he has reached a point in worship that very few others have achieved. Ray's worship takes you right into the throne room and the presence of God." - Dr. Col & Jan Stringer - Australian president of ICFM, international minister and author of 20 Christian books. "By far, this whole CD truly is some of the best intimate worship music that I have ever heard! It captures the longings and desires of my own heart for my Heavenly Father and for my Lord Jesus.... This will help anybody that is hungry for more of God to enter in, into true worship!" "I cannot tell you how much I have loved your CD and been wonderfully blessed by it .... WOW! I listen to it everyday and have plans to use it in our Healing House! Thank you, thank you, thank you." "Ray's music is genuine, passionate and heartfelt. He is never trying to produce music just to sell but expressing his heartfelt love for God in music. I totally recommend his music and ministry." "I have used this album for many years to come into the presence of the Most High God. It is awesome and the best album I own. The anointing on the album is sweet and Holy. I have never found any other to top it.... Ray is my favorite singer and Worship Leader. I have been using Ray’s music for years every day." "I cannot describe the place where this music takes my heart and soul... My soul soars to a place that I haven’t been in such a long time... Thank you again for reminding me how wonderful it is to return to His presence and weep at His feet and experience His special touch and to feel the move of His Holy Spirit as the tears fall again!" "What a joy to see that your heart has been to lean on Jesus's chest and hear His heartbeat and to teach others how to do the same. It's the place of much fruitfulness, that intimacy." "Honestly I have not heard a compilation of worship songs of this kind for years. .. I played them and everything around me changed. I felt like I was out of this world." "God bless you! Prophetic worship is the place that I love to dwell in. God is so very good!" "It is the most inspiring gospel CD I have ever heard. It has ministered to me daily and has given me the desire to return to Worship Ministries." "It touches something deeper in the soul... I cannot stop listening to it." "I cried for an hour after listening to your "Seek Me" worship set.......... Just incredible." "I am more than blessed by the music from this album and Ray’s others. There is a spirit of worship that enables me to personally enter in to my own Passionate Pursuit." "Words can not convey just how blessed we truly are with your music from The Secret Place. There isn't a day that goes by that we are not listening to it. First thing in the morning we put the cd in on the way to work and Oh His presence fills the car. It has so ministered to our hearts... Words can not express the blessing these mp3s have been in our lives." "Ray, I'd have to say that your free worship songs were the best I've heard on Mp3 in ages. Just ages." "This is anointed music that is so wonderful to soak in. It changes the atmosphere and HIS PRESENCE comes. THANK YOU." "Lifts the spirit and sends one straight into the throne room. God bless you and may He take you deeper into the river... Your music is always playing in our house filling the atmosphere of God's great goodness and love." "Every morning at the office, my staff and I get together and worship and pray over our business. We use your “secret Place” worship cds. We are all usually weeping and crying by the time we are done. We are blessed!" "I have fallen in love with your music and your heart from which it comes... I feel that I have been behind the veil and entered into the throne room to sit in our Father's lap. Thank you." "I really like your music. It refreshed me to love Jesus more. Thank you for doing it!... We have been very blessed, and God appears and refreshes us every time!" "This is a wonderful CD. I have bought 3 of them so far and have given 2 away to friends who feel the same as I do. I like to ‘use’ it when I am on my own. It really does help me to come closer to the Lord." "I can't tell you enough how much this CD has ministered to me. I can hardly put it down... I have to say I am totally addicted to it - it is totally life-changing. Thank you so much." "Thank you so much for this ministry... When I listened to the music as I read a few of the articles on soaking, I felt refreshed and I felt GOD'S PRESENCE again in a strong way (after a bit of a drought). GOD'S PRESENCE has become more and more prominent in my daily life." "Thank you so much for letting me download these songs. I could not afford them otherwise right now. I listened to some of your songs online and they are wonderful. I wanted to download some, but felt reticent to give such a small offering; then finally today, I could not resist it. My heart just resonates with your music." "Some of the songs are practically paralyzing... I wept, I shook..."
"It is very anointed.... you have managed to capture something unique... so far ahead of its time." "Your songs inspired me to have a little worship time of my own today, and it really reminded me how much I've missed it. Thank you for turning my heart back to where it should be... your site is already fulfilling it's purpose!" "This is an awesome cd. It is a great way to get into the presence of God. It also promotes you singing in your own heavenly language. I love it and find it is priceless." "Your music is truly unique. Some of the songs have such a quality of childlike purity and innocent devotion while others stir the deepest longings of our soul for "more of Him"... This music beautifully and passionately helps to pave the way for us to give expression to some of those deep longings of our soul... Your music is Spirit and Life and we love it." "I REALLY needed to hear this. Your songs always open up something in my heart and make me cry." "I cannot tell you how much I have enjoyed listening to your music tonight. Your songs are full of the kinds of desires and emotions that all people feel when they are coming to the Lord in the fullness of his mercy." "Your music has entered the inner most depths of my soul."